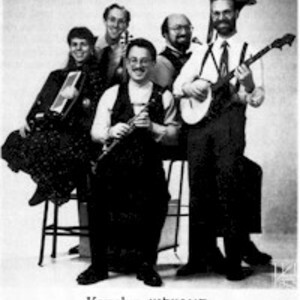 Kapelye features Henry Sapoznik (one of the foremost authorities on traditional period klezmer music), fiddle, vocals; Ken Maltz, clarinet, percussion; Eric Berman, tuba; Lauren Brody, accordion, piano; Josh Waletzky, piano, percussion, vocals; Michael Alpert, fiddle, percussion, vocals. Eric Berman (tuba,string bass) has performed with the San Antonio Symphony, the American Symphony, the American Concert Band and a variety of jazz and chamber groups. He holds the degrees of Juris Doctor and Doctor of Philosophy (Music), and is a specialist in entertainment law. Ken Maltz (clarinet) first became involved with Yiddish music as a young boy when he was often called upon to provide music for family occasions. A founding member of Kapelye since the band's inception in 1979, Ken has performed in hundreds of appearances on stage, television, radio and film throughout North America and Europe. As one of the early pioneers of the klezmer revival, he has received critical acclaim from both the domestic and international press. Such diverse sources as The New York Times and The Berlin Morning Post have spoken of his performances in the most glowing terms. Ever conscious of the importance of both promoting Yiddish culture and passing it on to future generations, Ken can often be found at festivals, conferences, master classes and workshops; instructing students both young and old in the art of the klezmer. Indeed, his love for klezmer music and his ability as a teacher have earned him a following of students on three continents. Peter Sokolow (keyboard and vocals) has appeared with klezmer musicians Dave Tarras, the Epstein brothers, Sid Beckerman, Ray Musiker and others of equal renown. Among his orchestrations are eight albums of Chabad (Lubavitch) nigunim, two albums for Shlomo Carlebach, the off-Broadway musical "The Golden Land", the Yiddish musical "Heintige Kinder" and the score for the documentary film "Partisans of Vilna." In addition to Mr. Sokolow's work in the field of Jewish music, he is a highly regarded performer in society , Irish and" pop" orchestras and enjoys a fine reputation as a stride pianist a la Fats Waller.